After about 20 hours of travel we made it to Mumbai via London. 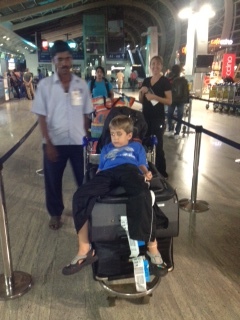 Ethan was a trooper and managed to sneak a couple of winks while navigating the airport in Mumbai. We have a 5 hour layover here from 12:00am to 5:45am and then just a 1 hour flight to Goa and then about an hour by car to Candolim Beach. The thought of being able to lay down and sleep sounds so good right now. All our bags made it but one which happened to be my surfboard. They said they would bring it to us in Goa tomorrow. This I will love to see!! The check point opened and we are on our way.